Please read the general introduction here. Please add your kigo and information. The Tidewater region is an incredibly verdant area, well watered by the numerous creeks and rivers, with ample rain and fertile soil. Every possible shade of green is to be seen in high summer. Summer forests appear as walls of green. World Kigo Database: All Shades of Green (banryoku) and more about "Green Kigo"
Previously published in Haiku Harvest and Eight Shades of Blue, Lulu Press, 2005. 'Sultry' just doesn't do justice to the oppressiveness when heat and humidity both hover near 100. August is infamous for weeks of hot muggy heat, but it can happen as early as April and as late as November. Previously published in Matsushita: a fusion of painting and poetry , 1996. The Chesapeake Bay receives its share of hurricanes, with the recent Hurricane Isabel causing considerable damage, even in places that had been safe from hurricanes for fifty years or more. While listening to the approach of Hurricane Isabel. Previously published in Haiku Harvest , Summer, 2006. A downside to the area. Ozone warnings are generally issued in summer when the weather and pollution combine to make breathing particularly difficult, especially for those with respiratory problems, the elderly, and the very young. People are cautioned to stay inside as much as possible on these days. Summer storms are common and blow a good hard gale. Mild storms may leave the region even hotter and more humid than they were, but a good hard one will wash the air and leave it fresh and clear. Corrugated tin roofs were a traditional roofing material in the region, and some houses and businesses still have them. The drumming of the rain on a tin roof is extremely loud. About half the tornadoes in the world occur in the United States. While Tornado Alley on the Great Plains is famous for its tornadoes, the unique topographic and meterological conditions in the Chesapeake region can provoke some wild weather and spawn tornadoes, along with the occassional water spout. Previously published in Chincotegue, Red Moon Press, Westminster, VA, 1996. Sport and commercial fishing are both widely practiced on the Chesapeake Bay. See also oyster and crab. Previously published in News and Observer, Raleigh, NC. Previously published in bottle rockets #10. A local peddlar in Baltimore with a horsedrawn wagon. Still in existance, Arabbers are usually African Americans who peddle useful items such as watermelons, soda, pantyhose, and toothpaste from their wagons. In other words, they are mobile convenience stores. ........... The CRAB is very important for the Chesapeake area. Jousting is the officially designated Maryland state sport. Jousting events are held during the summer. A descendant of medieval jousting, the modern joust is a speed and accuracy event in which riders attempt to lance progressively smaller rings at full speed. A folk art for Baltimore and the surrounding area. It was invented in 1912 when a Czech grocer decided to move his produce from the sunny sidewalk to the shady interior, and painted pictures of the produce on the window screens so that people would know it was still available. It worked so well it spread and became a folk art. Bars and roadside stands sprout to sell pit beef, pit pork, pit chicken, pit just about everything, slow roasted until it falls apart in a Chesapeake style bar-b-que! Delicious! The archtypical Baltimore rowhouse was about twelve feet wide and two stories high, with no front porch but a rear porch of wrought iron. This wrought iron was shipped to New Orleans where they liked it so much they put it on the front of their houses. In Baltimore, it was traditional for rowhouses to be entered by a set of white steps made of wood, or in more affluent neighborhoods, marble. Many rowhouses are still without air conditioning in the poorer neighborhoods, and people often sit on their front stoops to socialize or watch the world go by. At night, when they go to bed, they flip up the wooden steps to show that they are no longer receiving callers. Such rowhouses are often decorated with painted screens, a local folk art. If you walk along the shore at dawn and it is just low tide, you can just hear the tumble of shells on their way to being sand. at that point the flakes of hells are just an eighth of an inch across and the trailing edge of the waves tumbles them. there is a faint high pitched tinkle. The waterways of the Chesapeake attract hordes of tourists during the warm weather. Everything from kayaks to schooners can be seen running up and down the bay and its tributaries. A popular fundraiser for many volunteer fire companies, churches, and other not-for-profit organizations. The 'bull' is generally pit beef and other meat dishes, while nowadays the oysters often have to be imported from the Gulf Coast. The bull and oyster roasts are annual events which have been going on for many years; they are part of the rhythm of life in the small towns where they occur. The 4th of July is a major holiday in the United States, and is celebrated especially enthusiastically in the Chesapeake region, coinciding as it does with the tourist season. Boating and picnicking are traditional methods of celebrating the holiday. Fireworks are sometimes launched from barges rather than shore, and firework watching from boats creates boat traffic jams. Skipjack races are held during the summer at several locations. The races are part of an effort to raise awareness and appreciation for these old wooden workboats. The main contenders are the oldest of the still working skipjacks, the Rebecca T. Ruark (built 1884) and the youngest, the Martha Lewis (built 1955). The official state bird of Maryland. The male's plumage is black and golden orange, not unlike the colors in the Calvert shield (part of which makes up the flag of Maryland), which caused the bird to be associated on with Cecil Calvert, Lord Baltimore, the Lord Proprietor of the Maryland colony. In spite of its official status, its numbers are declining rapidly due to loss of breeding habitat in the Chesapeake Bay region and destruction of winter habitat in the tropics, as well as ingestation of pesticides via the insects it eats. These flying mammals exist in the Chesapeake region as everywhere. Given the multitude of insects that thrive in the marshy areas, they are even more necessary here. See also Little Brown Bat. Also called carrion crows are rapidly increasing in numbers in Maryland. Huge numbers may be seen circling like a tornado of birds. They like to roost near quarries. They fly up into dead trees to sun themselves and dry out after rain. Indigenous to southeast North America, boat-tailed grackles are dark songbirds with long, rounded tails and have long, narrow black beaks. Males are glossy black with a bluish iridescence on their bodies and a greenish iridescence on their wings and tail. The smaller females are cinnamon brown and do not have much iridescence. They can be distinguished from the common grackle by their much longer tails. Unique among North American songbirds, boat-tailed grackle sexes remain apart most of the year, except during nesting when, among the multitude of males competing, only a few dominant males actually breed. Grackles eat omnivorously: insects, crabs, shellfish, seeds, lizards, frogs, turtles, plant roots, grain, and more, feeding on the ground and in the air. They have few predators and can be a pest bird. Females nest in trees, in a nest of grass and leaves, in large colonies in same location every year. 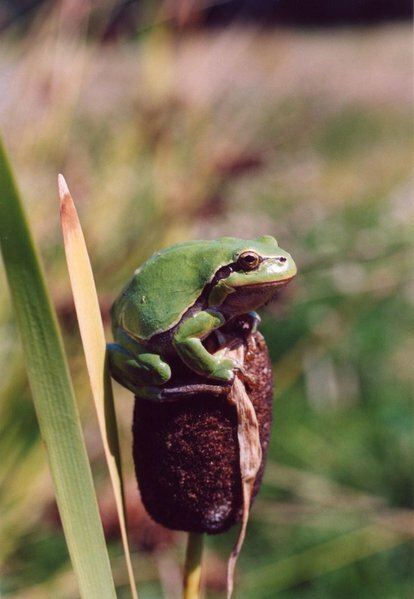 This is one of the largest frogs, commonly found in marshes, ponds, and in lakes and rivers without too many predatory fish. Their large appetite is satisfied with small birds and mammals, snakes and frogs, insects and crayfish. They breed May through July. Quite territorial, the males attract females with their loud and distinctive 'jug-a-rum" bass call. Bullfrogs occur in all counties of Maryland. A common summer sound in the region, and especially pronounced when the seventeen year periodical cicadas are active. Cicadas are large flying insects whose larva live by sucking on plants. Adults are 25 - 50 mm in length with transparent, orange-tinted wings and large red eyes on dark, orangey-black bodies. The Chesapeake region is home to seventeen year periodical cicadas; these cicada larva live underground for seventeen years then emerge, mature, mate, lay eggs, and die. The larva hatch, drop to the ground, and burrow into the dirt where they live on plant roots for the next seventeen years. It is the male that 'sings' a constant mating cry. Where cicadas are numerous, they are loud enough to drown out the sound of lawnmowers. Maryland's official crustacean, and a favorite food the Chesapeake region. Male crabs are 'jimmies,' female crabs are 'sooks.' Hardshells are crabs with hardshells, softshells are crabs that have shed their shells and have not yet hardened the new shell. Peelers are crabs just about to shed their shells. Crabs can be fished for using hand lines or crab pots. Chicken necks are a favorite bait. The CRAB is very important for the Chesapeake area. Previously published in 'Chesapeake Bay Haiku,',Audubon Naturalist News, Feb, 2002. The herring run up the creeks and rivers during the spring, and herring fishermen can net as many as four thousand in a night's work. Herring poaching is carried out by poor folks who sell the herring for ten cents each to bait shops. Herons, especially blue herons, are seen on the bay and its creeks during the summer. The Chesapeake Country is home to both thoroughbred and harness racings throughout the warm months. The Preakness Stakes, one of the jewels in horse racing's 'triple crown,' is hosted by Pimlico Racetrack in Baltimore. Numerous horse farms dot the region, and horses are kept for recreational use by many families. In addition, the Amish in the region continue to utilize horse drawn buggies and farm equipment and may be encountered in rural areas. Hitching posts in front of rural businesses are not purely ornamental. in the zoo parking lot. Jellyfish arrive in the middle reaches of the Chesapeake Bay in August. The drier the weather, the further north they go, and can become 'thick enough to walk on' in some areas. Jellyfish need salty water, and in dry years, the rivers that feed the Chesapeake provide less fresh water, and so the salt water from the ocean reaches much further north, bringing the jellyfish with it. By contrast, in wet years, the fresh water inundation may dilute the Bay enough to prevent their entrance. A periwinkle is a medium-sized aquatic snail that is often seen in the intertidal zone on rip rap or inching up and down marsh grasses as the tide changes. They feed on cordgrass while boat-tailed grackles and some other tidewater birds like to feed on them. It has recently been discovered that blue crabs are a major predator for the periwinkle, and where blue crabs are non-existant or low in number, periwinkles to major damage to marsh grasses, damaging the ecosystem. from boots in my boat. Previously published in 'Chesapeake Bay Haiku,' Audubon Naturalist News, Feb, 2002. The ospreys' eggs hatch, usually 1-3 of them, and the fledglings grow through the summer, until by August they learn to fly. The most common vulture, the turkey vulture, is frequently seen all over the region. Less common, but occassionally occuring in kettles of 50-60 birds, are black vultures. The clearing of land for development increases the amount of roadkill and landfills, making life easy for the vultures, who are proliferating as a result. Nonetheless, they are beautiful birds and magnificent soarers. According to Native American legend, the vulture loved flying so much that he ignored a summons from the Creator, and so the Creator punished him by making him eat carrion. The vulture regards it as no punishment at all because it gives him more time for flying. A large grayish shore bird of North America, having black wings with a broad white stripe. Willets nest and feed along the marsh grasses, mud flats, and sand bars. Bindweed is the common weedy version of the morning glory. It has white to blue flowers, smaller than the cultivated types, and the flowers open and close daily, as opposed to morning glories that bloom only for a single day. This wildflower is frequently planted in the medians of highways and also occurs wild in meadows and other uncultivated areas. It is also used as a landscaping and garden plant. It blooms beginning in midsummer and continues through to late summer/early autumn. The bright yellow flowers and thin stems may look delicate, but are extremely tough, making it an ideal plant for roadside plantings. 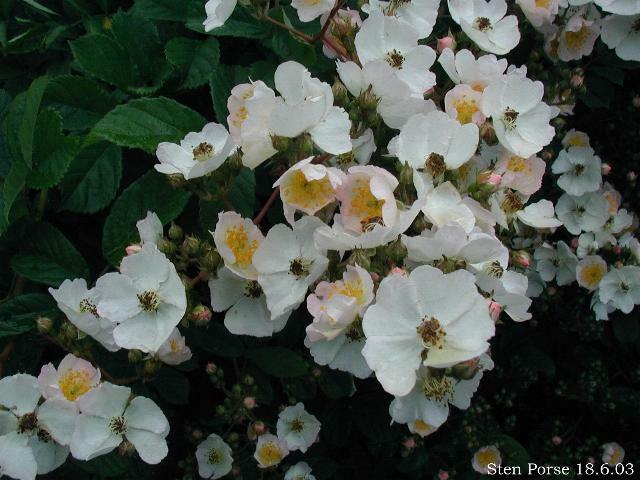 Briar roses, or wild roses, are a common wild plant formerly planted for erosion control and hedges. 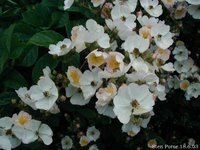 Often found growing over fences , in pastures, and along roadsides, in the early summer their delicate pink or white blooms creative clouds of blossom and scent along country roads. The more floriferous white shrubs are invasive and not native to the region, but the smaller, more delicate, pink and pink-tinged briar roses are not as invasive and are native to the region. Summer (July-August). Cattails are very common in the Bay's marshes and tributaries. These aquatic weeds are perennials which may mature at 5 to 10 feet tall. The flower cluster or fruit is cigar-shaped. When mature, it becomes cottony and seeds are dispersed by the wind. Cattails germinate in April, maturing in late summer, July and August. A bamboo native to the swamps and damp woods of the Atlantic coast of the United States. Originally from the eaastern Mediterranean and once widespread, hollyhocks are no longer so popular. They are usually seen in the dooryard gardens of old houses and bungalows. These small older homes are often showing their age and may be completely derelect. Sadly, when they get rennovated, the renovation includes only the house and not the garden. Hollyhocks can reach nine feet in height and bloom in a variety of colors, including singles, doubles, and puffball blooming habits. There upright stalks grow from a low rosette of very large leaves at ground level. The leaves are popular food for Japanese beetles. Biennel, hollyhocks reseed freely and are therefore effectively perenniel in favorable conditions. A large group of more than 500 plants, including numerous ornamental flowers which bloom in the morning, are pollinated by hummingbirds, bees, or other creatures, and die in the afternoon. Blue blooming bindweed (Ipomoea purpurea) is a common weed in the Chesapeake region. Species native to Asia and the Americas have longed been used in traditional medicine. However, if taken to excess, they are toxic. Care should be used to prevent ingestation by children and pets. 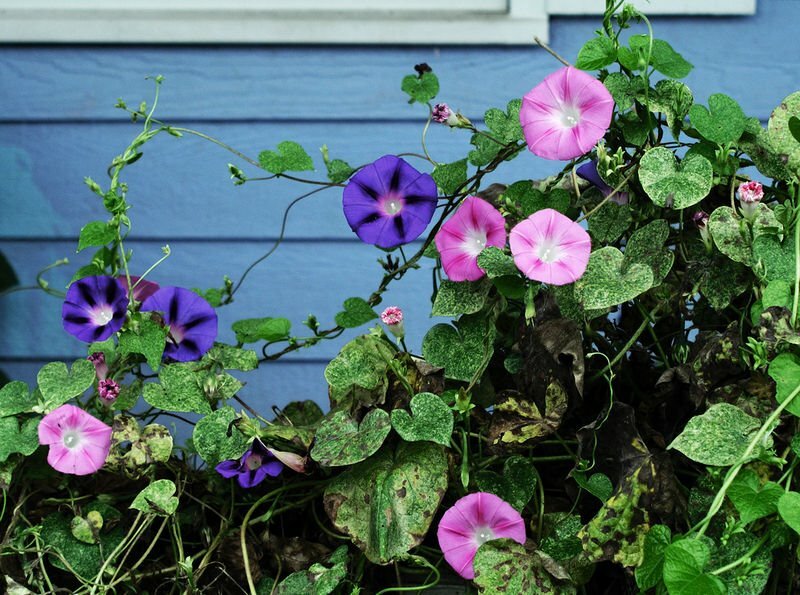 The morning glory is known as asagao (morning face) in Japan, where it was imported during the 9th century. 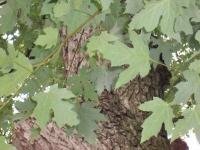 Swamp maples, also known as water maples and silver maples, are native to eastern North America. Thriving in damp climates along waterways, they grow 25 - 35 meters high. They grow swiftly, and when given a little room, develop a broad shady canopy making them prized as shade trees, but their roots can be invasive, thanks to their quest for water. They acquired the name 'silver maple' because the underside of the leaf is white, so when blown by even a light breeze, the visual effect is striking. All poems copyright by the authors and used with permission. All images, unless specified otherwise, are courtesy of the WikiCommons project and are posted in accordance with the licensing agreement(s) accompanying each image on that site.
. BACK TO .. .. .. Chesapeake Bay, USA .